We had a frost on the side where the garden is. But, we had already harvested our pumpkins. We had 38 of them! First of all, I am giving quite a few of them away to various friends and neighbors. Secondly, I will probably cook at least one of them up and put it in the freezer as puree. But the rest of the ones I’m keeping? I’m working on dehydrating them. I thought I’d share how I’m doing that. How I’m dehydrating my pumpkins. Wash it to get the worst of the dirt off and cut it up. 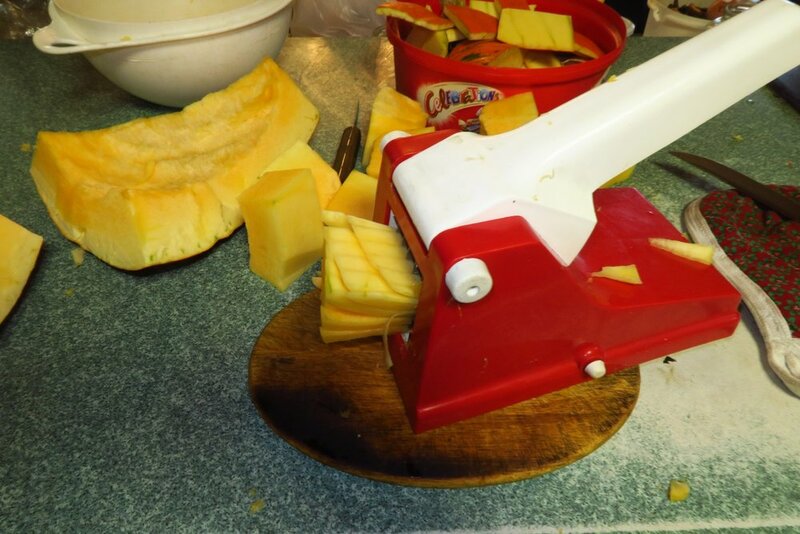 Use a big knife and cut it in half or in chunks. Scoop out the seeds using an ice cream scoop. If you save the seeds, put them to one side. Otherwise, throw them in the compost. 2. 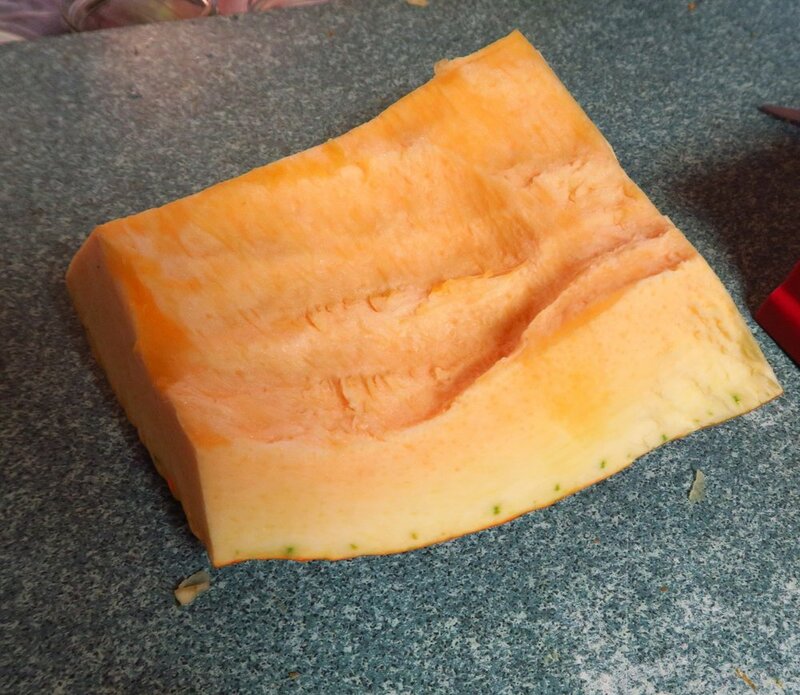 Cut the pumpkin into smallish chunks. 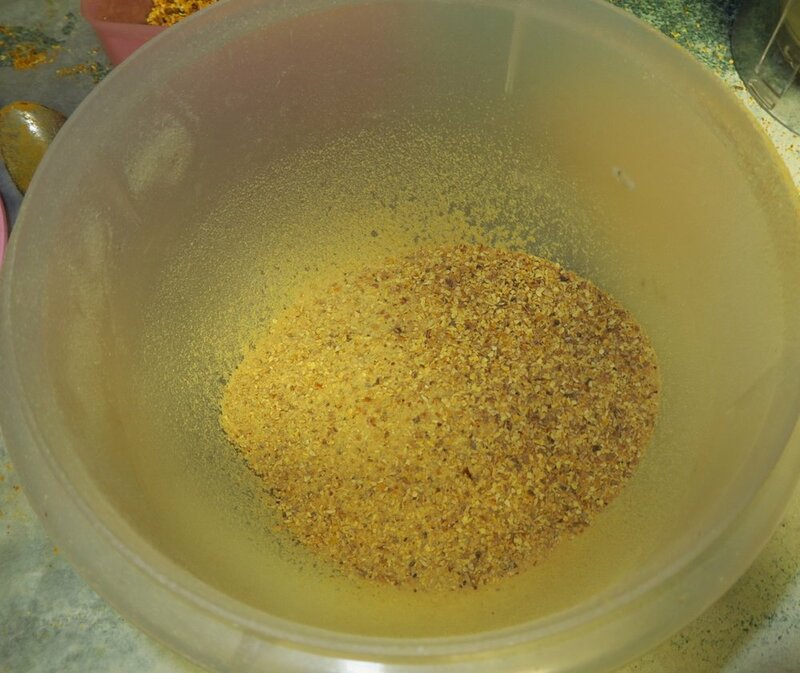 Cut it up after you have cleaned out the middle mushy/seeds stuff. 3. Cut it into chunks. So far I haven’t taken off the rind. I use a knife and cut it off. 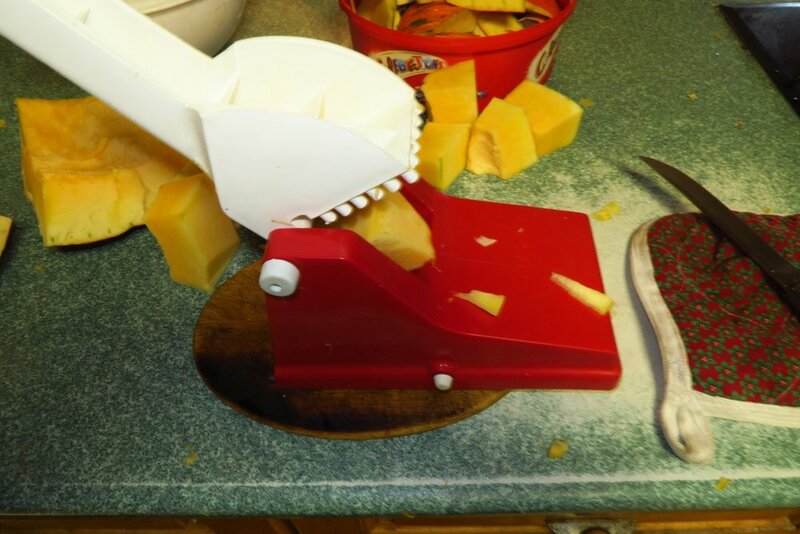 This creates nice small pieces of pumpkin. You could also cook them as french fried pumpkin They are really good! I put the strings in a pot that has holes in it in an effort to steam them for 3-5 minutes before dehydrating. Steam for 3-5 minutes. I leave a lid on the top in an effort to keep as much steam inside as possible. I put them in a metal pan so they could cool off a bit before I handled them. Try to be neat and not stack them on top of each other. Pumpkin is 90% water, so they will shrink down quite a bit. Set timer for 2 hours. Every two hours for 10 hours I changed the trays around. Before I blended I let them cool off completely. After they were all cooled off completely, I put them in the blender. Blend until you think they are powder. Here’s what you’ve got! Some powdery looking pumpkin colored stuff and some small pieces. 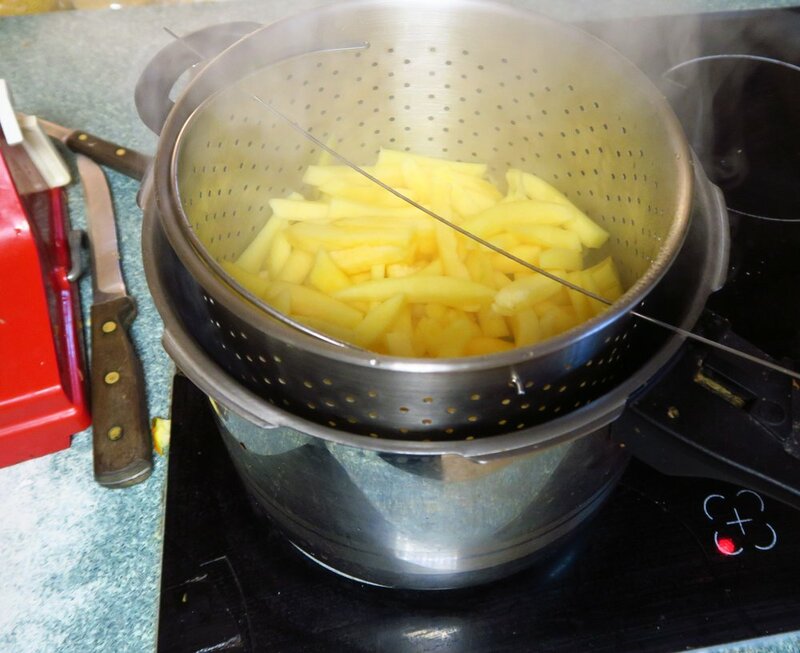 It helps to make sure the bowl is big enough and fits the strainer nicely. Pour all the contents from the blender into the strainer. Shake gently. Anything that doesn’t fall through put through the blender again. And again. For the last things that don’t want to blend, put in the dehydrator again to dry some more. I found that I could spread it on the very bottom of mine and let the fan dry it for about 30 min. and I could put it back through. 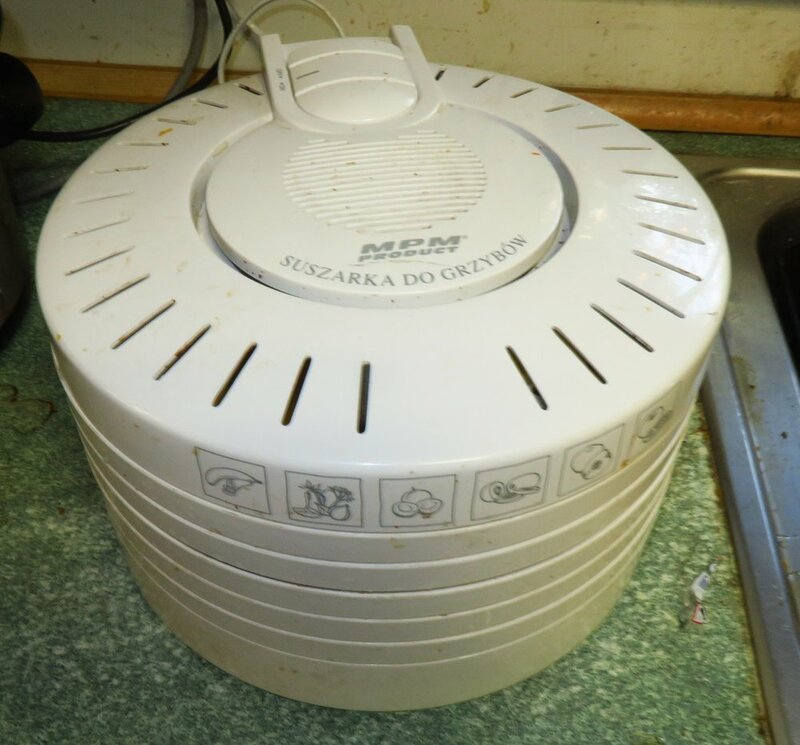 I could do that because my dehydrator has a fan in the top. Take a look at what you’ve got. 23. All that work and it makes just a little! Continue to add to your jar. This jar holds 1.7 liters. 24. My collection so far. This is what I’ve dehydrated so far. 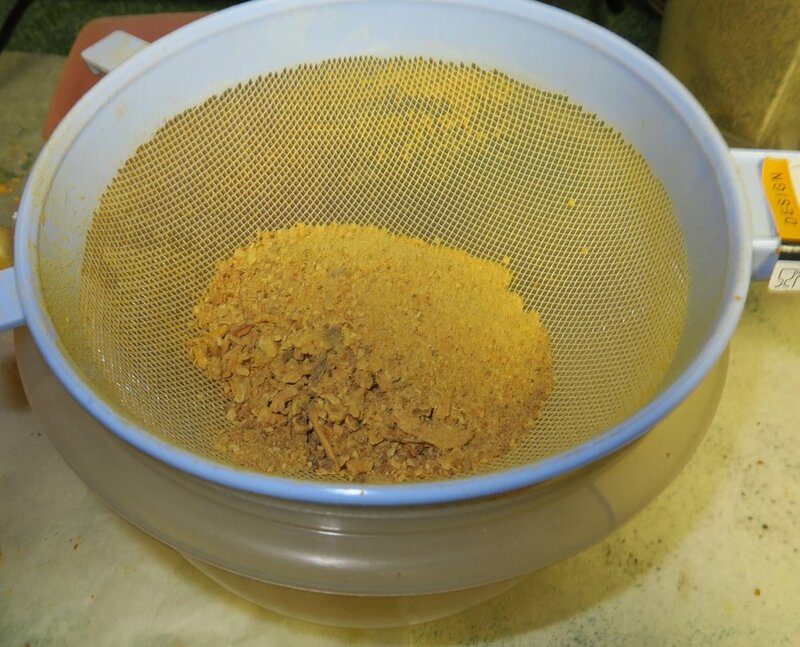 The ratio is 1/4 cup pumpkin to 2 cups of boiling water and let sit for 20 minutes before using in cake or pie. This should save me quite a bit of space! And so this is a fitting end to the best pumpkin growing season I’ve ever had in my life.